Miguel Claro recently sent Space.com this cool image of the constellation Ursa Major, or the Big Dipper, shining over the road to Roque de Los Muchachos on the island of La Palma in the Canary Islands, Spain. He used a Canon 60Da camera (ISO2500; 24mm at f/2; Exp. 15 seconds) to capture the image. The famed Big Dipper star pattern, part of the iconic bear constellation Ursa Major, pours starlight over a stargazer on the La Palma road to Roque de Los Muchachos in Spain's Canary Islands. 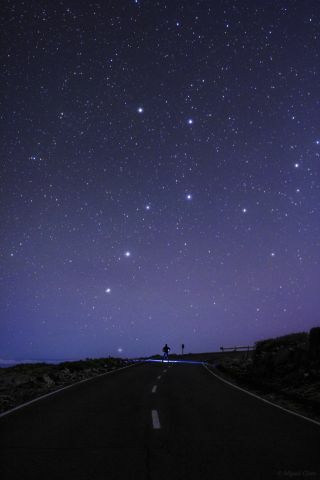 Astrophotographer Miguel Claro recently sent Space.com this spectacular image he titled "A Road to Big Dipper." He captured the photo on Sept. 30, 2013 using a Canon 60Da camera (ISO2500; 24mm at f/2; Exp. 15 seconds). He used a diffuse filter in the camera lens to increase and highlight the main stars of Ursa Major. Those living north of the equator simply need to look toward the northern part of the night sky to locate the seven bright stars that comprise the Big Dipper, also called the Plough. It is one of the most recognizable patterns in the sky and one of the easiest for the novice to find. The constellation known as the Crux, or the Southern Cross, is the constellation people living in the Southern Hemisphere choose as their guide to the night sky.